Average tax return preparation rates are published by the National Association of Accountants in the national and regional average tax preparer fee survey for 2016. The fee for my online remote tax services is typically about 1/3 lower than typical walk-in tax preparers. However, late season returns or services that do not use online cost savings are not discounted and may be at average rates or higher). Actual fees vary because many clients make additional requests or present unique circumstances. As always, CPA and EA tax preparers typically charge a little more than average and non-credentialed preparers may charge a little less. The northeast U.S. region is higher than the national average. 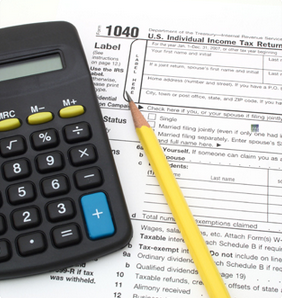 The list includes only the most common tax forms, not all tax forms. Tax preparation fees do not include accounting procedures necessary to obtain the figures for tax returns nor the cost of research to establish documentation of sustainable positions. The cost of tax accounting service typically runs 1% to 4% of gross receipts in the majority of small businesses. I am happy to discuss fees and related issues for your specific situation in a no-obligation initial telephone consultation. In the event that I offer tax services, the terms of service are described in writing in a tax service engagement agreement. A sample engagement agreement is available here. My personal pricing goal is to use the savings available through remote online tax preparation to undercut the industry average rates by 15%. The first figure in bold is the published regionally adjusted industry average. In addition, I strongly recommend a tax planning consultation as the most effective way to reduce future income tax liability. The fee for this popular add-on service for individuals, including a telephone consultation and written follow-up report and up to five tax scenario projections remains a flat $300. Complex situations, of course, justify more attention.